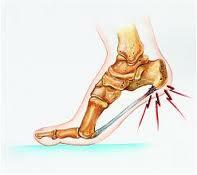 A heel spur is a radiological (X-ray) finding, often seen in those suffering from plantar fasciitis. It consists of a thin spike of calcification, which lies within the plantar fascia at the point of its attachment to the calcaneus, or heel bone. While this condition is commonly present in plantar fasciitis, it is a result of the inflammation, and is not the cause of the pain caused thereby. The X-ray findings are not diagnostic, and are commonly reported in people not suffering from fasciitis. Custom orthotic inserts can help alleviate the inflammation and over time the heel spur will resolve (reabsorb) itself. Heel spur pads are often inlcuded with the orthopedic inserts to provide extra support and cushioning. Have your questions about Heel Spurs answered by Dr. Michael Horowitz by calling 604-737-3668 or by filling out the form below. He will respond promptly.